Embalming is a process that results in replacing blood with a substitute chemical fluid. The purpose is both to temporarily preserve the deceased and/or for cosmetic purposes if the farewell ceremony is to include an open casket. I have obtained several quotes and I am confused about embalming: is it required? Only in very limited circumstances. In general, the law does not require embalming. However, a body must be embalmed if the deceased died while infected with a communicable disease (other than anthrax, plague or viral hemorrhagic fever) and is to be transported by common carrier. Embalming is not necessary to transport the deceased by private vehicle or by a vehicle owned by the funeral home. When death resulted from anthrax, plague or viral hemorrhagic fever embalming is not permitted. Instead the deceased is placed in a sealed container. A funeral home can embalm if it is requested to so do. If you are concerned about how the embalming will be done, you can also ask the funeral home to see its “code of conduct” for embalming (the home is required by law to have such a code of conduct). Caskets are all so expensive. Do I have to have one, or can I make my own pine box? The price of a casket can range from a few hundred dollars to several thousand dollars, depending on the kind that you choose. For example: a hardwood or metal casket will be much more expensive that a simple plywood or cardboard casket. Things like fancy trims can also add to the price. In the past few years, more and more “green” caskets have become available; they are sturdy enough to contain and bury the deceased, but they are bio-degradable. Often, less expensive caskets are not displayed, and you may have to ask specifically about alternative options (such as making your own casket or rental caskets for ceremonies). Although there is no law prohibiting you from making your casket (as long as it complies with all legal requirements), a funeral home may choose not to use any casket other than one from one of its providers. Be sure to discuss this issue with the funeral home before you sign a pre-need contract. I was told that if I want to be buried, I will need a permit. Is this true? Yes. In order to bury, cremate or otherwise dispose of a body, a burial permit is required. Permits are often printed by funeral homes on behalf of the family when funeral arrangements are being made. Burial permits may also be obtained from a hospital registrar. A cemetery will not consent to a burial without the prescribed burial permit. Similarly, a crematorium will not consent to a cremation without the proper permit. Can I be buried anywhere, or does it have to be in a cemetery? Burials must be made in registered cemeteries. Cemeteries can be owned and managed by churches, local municipalities or private businesses. There are two ways to be buried. The first is the traditional earth burial, where the deceased is placed in a casket and lowered into the ground. The second type of burial is less common: it involves placing the deceased and the casket permanently in a mausoleum, or tomb, above or just below the ground. Can’t I just be buried on my family’s land? No. There are a number of steps that must be taken to ensure it is done properly and legally. As part of this, arrangements must be made with a cemetery or crematorium. Burials must be made in registered cemeteries. This is because there are certain health issues involved in burying bodies, and an improper burial can lead to health crises such as an unintended contamination of a water source or the spread of disease. It is the legal responsibility of the spouse, next of kin, or person who has full knowledge of the facts surrounding the death to complete a Registration of Death form. Vital Statistics must be informed of the death. So, too, must the Canada Revenue Agency. It really is not possible for a death to not be noticed. Eventually, an illegal burial would come to light and the next of kin would find themselves in trouble with the law. Consider, instead, the scattering of your ashes on your family’s land. I want to be buried next to my spouse. Can I do that? In general, it is possible to arrange for the purchase of two side-by-side plots. In some cemeteries, it is also possible to arrange for something called “double occupancy”, which is when cemeteries allow two burials in one plot, one deep and one shallow. As always, when making your decision, be sure to look into the various fees and costs for these different options. I have received quotes and I do not understand all of the different costs associated with burial. What are all of these things? Cemetery and burial costs vary widely, as can the list of items that is “included” or “extra”. Items often considered are the following. Plot prices. This is the price of the piece of land itself. The price will vary not only by the cemetery and its location, but the location of the plot within the cemetery itself. such as your previously deceased spouse (this is known as a “double-occupancy” grave). suppliers. So, if your heart is set on a particular marker or epitaph, be sure to double check the details before you sign a pre-need contract. Grave closing fee. Again, this may be included, or not. Surcharges. Sometimes cemeteries add surcharges for other matters. For example: some cemeteries add an additional amount if the deceased resided outside of the municipality. Permanent Care. There may be additional fees for the care of the gravesite. For example: lawn maintenance. The exact cost varies by cemetery. The cost may also depend on other factors. For example: certain types of grave markers (the vertical kind) involve more maintenance (such as weeding) than others (the flat inset variety). My sister in the United States mentioned that she has arranged for a “green burial”. What is this, and is it possible here? The term “green burial” refers to a growing practice of caring for the dead with minimal environmental impact that furthers ecological aims such as the conservation of natural resources, reduction of carbon emissions, protection of worker health, and the restoration and/or preservation of habitat. 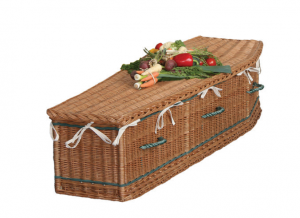 Green burial favours interring the deceased in either cloth shrouds or in simple caskets made from sustainable materials (such as pine or wicker). Grave markers, if used at all, are typically made from native fieldstones and set flat to the ground, though shrubs and trees may be used instead. Bodies are laid into vault-free graves, in a natural setting, legally protected as a cemetery. Green burials have become common in the United Kingdom, and the United States now has over 30 green burial and hybrid cemeteries. In Canada, there are currently two such sites, one on Vancouver Island and one in Coburg, Ontario.